To be short, I’m a part time worker (apprenticeship) at Microsoft and still studying at EDHEC (a French Business School). As part of this program, I have to attend « Summer Courses » in foreign Europe countries. This year, I chose Zagreb (yes, class is cooler under the sun) for 3 weeks and I attend a « New Media Marketing » class. For this class, I must write articles on this blog and promote them on Social Networks. So, let’s go! I start this series by a quick reminder of the Marketing basis that I’ve learnt (again) yesterday in class. 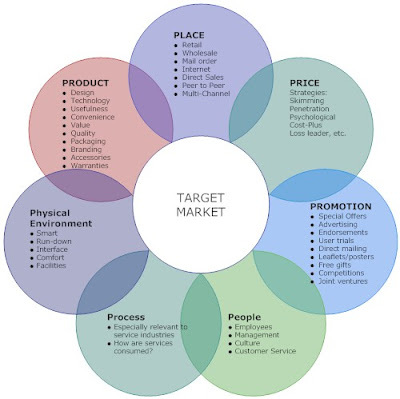 Marketing is « the activity, set of institutions, and processes for creating, communicating, delivering, and exchanging offerings that have value for customers, clients, partners, and society at large. Price -> At what price do I sell my product knowing how it costs in production and how my competitors sell their similar products? Promotion -> How do I communicate around the product to promote it to my customers? Placement -> Where do I sell my product to have the best market? Briefly, the Marketing Mix is the product and what image I want to give it to my customers, who can buy it and at what price. New Media Marketing: What is it? With the growing power of Social Networks, the Marketing can extend to reach more customers, differently. Now, brands can be in direct contact with their customers via their facebook page or Twitter (or others). These platforms bring together the two players and customers become then the best (or the worst) ambassadors of the brand (or product) on their networks, sharing with friends and acquaintances. In fact, having a friend telling you that: « this toothpaste makes my teeth really white » is more reliable and trustworthy than the advertisement for the same product between the « car of your dream » and « the new washing powder washing more white than white is ». Therefore, the idea of the brands is to make people talk of their products on their networks. Waiting for news, you can read this Mashable post about StoryBook, a new social App for Brands.